Making coconut flour tortillas on the Hestan Cue. Disclaimer: I have not received money, nor have I received a review product from Hestan Cue. I did not pay full price for the Hestan Cue smart cooking system with pan; I received a discount as an IFBC 2017 attendee against the going price of the unit. My review is an independent one, as I have no affiliation with Hestan Cue, Joule, nor am I an affiliate of HC, Joule, or an Amazon Affiliate at the time of this writing. NEW UPDATE! Subscribe to MyAllergyAdvocate, and by adding your email to our mailing list, you will receive an email with an exciting offer. Offer expires October 1 2018. Want to wow the foodies in your life, even if you are on a restrictive, medically-necessary diet? I do. I love good food, and always have. I was the kid who hated school lunches, preferring to pack a banana leaf wrapped around glutinous sweet rice, egg, and diced meat in a triangle, called Zongzi. While the other kids devoured peanut butter and jelly sandwiches, I nommed a sushi roll with cucumber, pickled daikon root, and fish. College friends laughed at me that I ate my burger with a knife and fork to create the perfect bite of beef, bacon, lettuce, and tomato, or brought my own container of mustard in my handbag. The jokes really got bad when I insisted on bringing my own silver chopsticks to restaurants instead of eating with disposable wooden ones. Hey, who likes slivers of wood in your food, right? By 2006, I began to have a series of digestive “issues” that flared in an unrecognizable pattern. To cope, I began to eat a bland diet that still included wheat, soy, potatoes, meat and fish, and cut out eggs and dairy. I found myself cooking more, though everyone in my family pretty much knew I was the worst cook of all of them, even my father. Still, I was sick. And my food wasn’t exactly tasty. But after hosting a house party for 30 people where I cooked Jiaozi (Chinese dumplings), roasted baba ganoush with bread, and a host of side dishes and finger foods, I was exhausted, sick to my stomach, and angry. How can a foodie enjoy her food if everything she eats makes her sick? Well, if you’ve been following along since the inception of My Allergy Advocate, then you know the rest of the story. In came the Celiac Disease diagnosis (finally!). Then came the frustration of learning to cook all my foods and remove processed foods along with wheat, barley, rye, soy, dairy, nightshades, corn, alliums, and excess sugars. Then came the other losses, like tamarind, certain gluten-free (GF) flours, almond, and gourds. One by one, I was reduced to a thin broth, rice, and coffee. There are only a few print recipe books and a couple of digital sites I could use that had recipes that were mostly compatible with my new diet, but if I wanted fancy food like my former food-appreciating self, it felt like I was in a food desert, only surrounded by endless mounds of food that I couldn’t eat. Grocery stores felt like depressing places, a place to haunt rather than to shop. I got angry. And then, I rolled up my sleeves and got cooking. At the Hestan Cue test kitchen in Seattle, WA. It was, “Everything eggs” day, and we each got to experiment making eggs in the Hestan Cue using Manual Control. How do you make the perfect egg in each of the styles from over easy to scrambled? Fast forward to late November 2017, I purchased a Hestan Cue Smart Cooking System (skillet and induction burner) after seeing a demonstration of what it could do at the IFBC 2017 in Sacramento. My every intention was to get a real-world review of the Hestan Cue from the perspective of a person who eats primarily real food, cooked in her own home, composed mainly of single ingredients instead of processed foods or commercially-made foods as found in restaurants. I even wrote a short description about it, and included it in my post for My Favorite Kitchen Things for 2017. I didn’t want food that I could just eat and get by with: I wanted food that I could eat that everyone else around me would also want to eat, even people who didn’t have food restrictions. I would have all the good tasting, fancy food, once again, like the food I saw on PBS cooking shows, in restaurants while traveling the world, and in decadent examples of gastronomy on Social Media. I tormented myself by watching, “The Great British Baking Show” on weekends. “Let me try it for awhile, and then we’ll see,” I said. I had a hunch M was dead wrong, though I admit, M is thoughtful about his comments and doesn’t always give a strong opinion off the cuff. What if he was right, and I had wasted my money and misaligned my hopes? The last seven months of cooking with the Hestan Cue, joining the group, Cooking with Hestan Cue on Facebook, and meeting the Seattle Hestan Cue team in their test kitchen located in Fremont (along a part of Seattle’s iconic waterfront and houseboat community) gives me more than enough evidence to say that not only is the Hestan Cue a fun tool to cook with, the Hestan Cue is THAT cooking tool that gives both hesitant home chefs the adulting skill of cooking from basic to complex dishes, it also offers accomplished cooks access to a video library of professional cooking skills, presentation tips, and recipes that will wow the foodies in your life. In a nut-free shell, the Hestan Cue makes food fun again. In seven months, I upped my game in cooking, and I feel most close to my former foodie self, pre-diagnosis. You can’t even put a price tag on the control and freedom of cooking that I purchased through the Hestan Cue cooking experience. I knew I wouldn’t like it if the set up for the Hestan Cue was challenging. 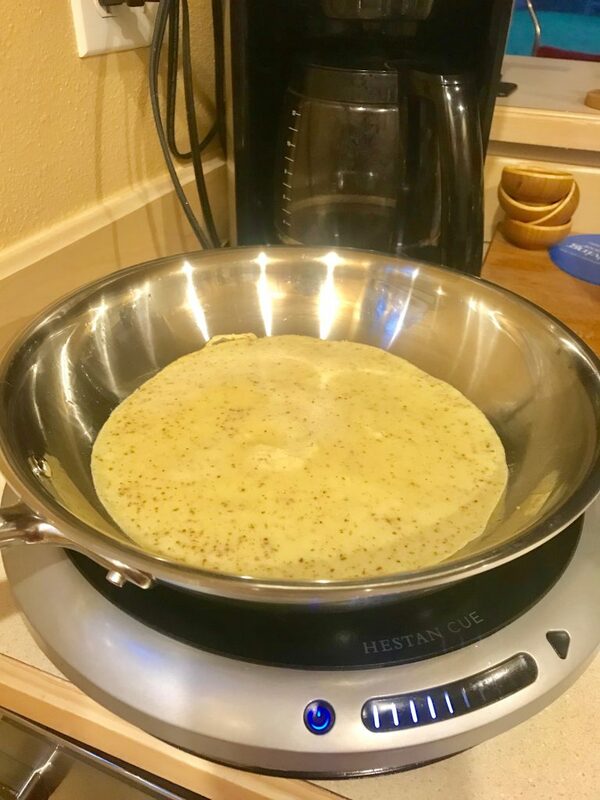 After putting in the battery into the handle and downloading the app to my iPhone, pairing the induction burner and skillet was fairly straightforward and simple. Other than one minor hiccup with a software update back in April, I have had no other issues with the cook system’s sensors and WiFi connection as controlled through the app. Similarly, I wouldn’t enjoy the cooking experience if the Hestan Cue skillet was difficult to clean or to keep looking brilliant, use after use. The Cooking with Hestan Cue team members and the growing community offered their tips on keeping my skillet clean with minimal scrubbing or elbow grease. Got baking soda and vinegar? A warmed pan with these ingredients, plus warm water and a non-bristled soft sponge are all you need, seriously. Cue app recipe for Pan Seared Scallop with carrot ginger coconut sauce. This is the first time I tried the Cue app recipe with Hestan Cue. Using videos and easy written instructions, this dish was easy to make and plate. The first evening cooking with the Hestan Cue, I tried to make Pan Seared Scallop with a Carrot Ginger Coconut sauce. With 25 ingredients, would this be too intimidating for a home chef like myself, who has limited experience cooking with multiple steps and so many ingredients? 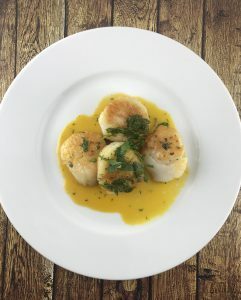 By watching the Cue app videos of award-winning chef Phillip Tessier preparing fresh cilantro, brining the scallops, basting the scallops in the pan, and preparing the sauce, I set up my mise en place, used the brine time to prepare the sauce, and got to work executing the baste like a pro. There was a flurry of activity in the kitchen, and M stared at his laptop from the couch across from to the kitchen counter area. “Do you need me to help?” M looked up from his screen. “I got this!” I replied. After straining the sauce, plating the seared scallop, a side of vegetables, and adding our usual brown rice, I looked at the photos of finished plates to grab some ideas about presentation. I’d come this far — why not make it “white tablecloth” fancy, and apply the sauce the way one often sees food served in a fine restaurant? And that was just a single recipe. What about the other recipes in the Cue app that I hadn’t even perused? Lord, help me! I was back in foodie land again. By looking up entrees you are interested in learning to prepare, and then mixing and matching recipes and sauces from the app, the Cue app’s video library puts you a cooking class customizing beautiful and delicious meals in the comfort and allergen free safety of your home. The culinary team continues to add new recipes, and of course, each recipe is tested on the Hestan Cue to get precise timing, temperatures, and activities such as flip time, basting, and stirring. Community for Your Hestan Cue? You Bet! After I bought my Hestan Cue and set it up, I was sent an email to join the Hestan Cue community, “Cooking with Hestan Cue” on Facebook. Administered and monitored closely by a member of the Hestan Cue team, you can ask questions about your unit, troubleshoot issues, talk about individual recipes, and get feedback on your finished plates of food. Before long, I began getting questions and comments from other Cue users who were curious about my ingredient substitutions. 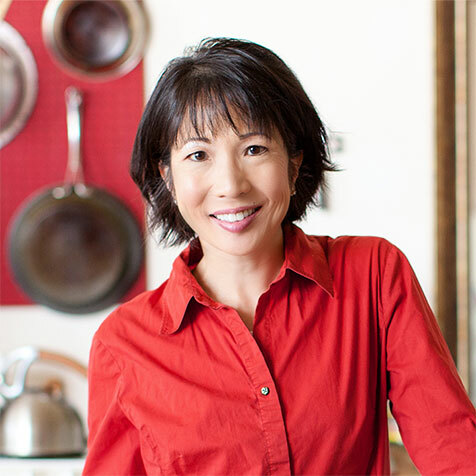 I have also virtually met other gluten-free members, and talked with their Culinary Science lead about the best ingredient substitutions for some of their recipes. I enjoy the non-sales-y, low-key environment of the growing community. Even a home chef like myself who has no restaurant cooking experience and no formal cooking school background can feel at ease chatting with other accomplished cooks and restaurant chefs. 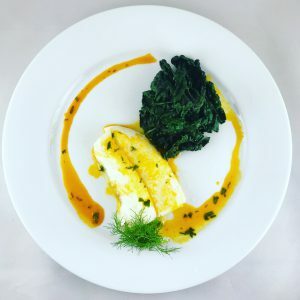 They have shared great tips on plating, combining of sides to create balanced meals, and ingredient ideas. If you have ever received an electronic gift that arrived broken or not working optimally, you know what a bummer it is. As it is with all electronics, hardware, and software, something can stop working, leaving you in the lurch. You need support available. In two different cases, I needed support for my Hestan Cue, and their phone support, email response time, and troubleshooting were spot on, timely, and effective. So far, the most complicated action I have had to do is change the battery in the handle. I am not kidding, it is that easy. I have not met a person who eats bacon who has not burned it at least once, unless s/he doesn’t cook! I suppose you could always go out to eat if you had no food restrictions or allergies to worry about, but for those in a similar boat to me, you are cooking most of your food at home. With the Hestan Cue, you will never burn the bacon again. How do I know? Because I’ve cooked bacon on the Hestan Cue multiple times, and it turns out perfect every single time. How does it work? Once you connect the Hestan Cue to the app on your mobile device, it leads you step by step to making the perfect crispy bacon. It sets the temperature and keeps it where it wants it; there are no uneven heating spots on the pan. You can see the exact temperature on the app, the remaining time until the flip, and it gives you a pleasant sounding, “Ding!” and a message on your device when to flip. Could you do this on a standard cookstove? Absolutely! So why do we burn the bacon? Most likely, we’re doing several things at once, and not paying attention. The Hestan Cue sensors pay attention for us, and the reminder to flip at the right time keeps you from burning the bacon, overcooking, or undercooking. You get perfect bacon, every time. So, does the Hestan Cue actually teach you to be a better cook? 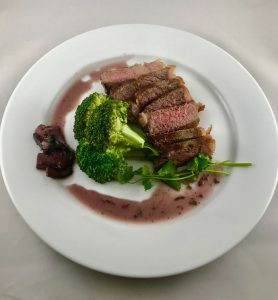 Pan seared New York strip steak with red wine ragout, broccoli, and thyme, cooked on the Hestan Cue. on grill or standard cookstove, require skill to perfect. Good cooking does not have to be complicated, but the best cooking is about food science, fresh ingredients, precision cooking, and attractive presentation. The only way I could know if my cooking had improved was by using the Hestan Cue over time on the same dish, and seeing if the level of precision yielded a measurable, albeit somewhat subjective, improvement. You might be thinking that M lucked out in being the test subject, but may I remind you that as the son of a restauranteur, as well as a person who issues compliments sparingly, M’s judgment meant that I had my work cut out. Would the Hestan Cue pass the test? M ate everything I cooked on the Hestan Cue, instead of passing over the food. He really liked the coconut carrot ginger sauce. We both really liked the serrano chile and orange vinaigrette (served with halibut). He noted that I could improve on the pan seared halibut, as it fell apart during the flipping process. The honey and herb lamb skewers were really nice, easy to make. The red wine mushroom ragout could go with anything; paired with the New York strip steak, that made me feel accomplished. “That is a true medium rare,” he said of my pan-seared New York strip steak. Traditionally, I had always overcooked the meat, to the point that I had almost given up on hearing anything other than his complaint. “That was too salty,” he said about the first attempt at a brined scallop. “Better,” he said, of the next attempt at pan seared brined scallops, because I did not add any salt post brining. “Did you think of that yourself?” when I served poached pears with lavender simple syrup as a dessert. I had become more comfortable with cooking on Manual Mode on the Hestan Cue. “That looks nice!” M said of presentation of the meal, which included pan seared beef, asparagus, and potatoes. On the side of the plate, a small ring of thyme leaves, oil, and cooked mushrooms. 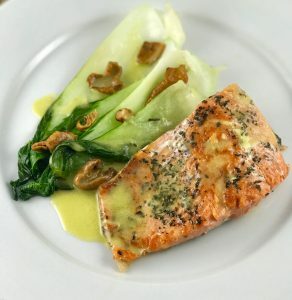 Sous vide Wild Salmon, then pan seared on the Hestan Cue, with goat butter sauce, bok choy, and chanterelles. Finally, the big test arrived. For our anniversary week, I cooked three dinners on the Hestan Cue from past favorites I had made. Nothing was overcooked, dried out, or bland. Each dish was plated, with attention to an attractive presentation with visual space on the plate. I had learned, as many artists come to understand, that the white spaces are as important as the colors. Ingredients were layered, so that each bite contained multiple flavors or textures. I recently asked M if he thought my cooking had improved because of my use of the Hestan Cue. While he admitted that my cooking had improved overall, and that I had introduced new foods and combinations, he would not directly attribute these changes to the Hestan Cue. Harumph! However, in the same period of time, I did not introduce anything new to the kitchen other than the Hestan Cue. What else would explain it? I started looking back through my food photos, and I could trace the marked change in what I had been creating on the weekends. While weekday foods remained the same, the weekend foods were more varied, colorful, and beautiful. 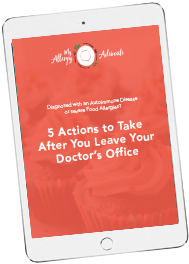 If you are reading this post on the My Allergy Advocate website and not somewhere else, it means that you likely have some kind of food restriction, allergy or intolerance, or chronic illness that makes feeding yourself (or someone you cook for) a challenge. My whole reason for wanting to learn how to be a better home chef is that it is very difficult to feed me unless I am in a clean, gluten free and allergen free kitchen under my control. But even with that, eating nutritious and tasty food doesn’t just happen because I have cookbooks on the shelves. More than half of them are standard cookbooks that are filled with ingredients for which there is no offer of substitute foods. What do you substitute for things like garlic, onions, milk and cream, cheese, corn, bread, soy sauce, tofu, beans, peppers, or tomatoes? Even if you could figure out the substitutes, do you have the actual skills to prepare the foods professionally? Do you know how to prepare minced ginger? How about leafy cilantro? How are your knife skills? Does making a true medium rare or a true medium presentation of beef sound intimidating, or is it hit and miss? People have asked me, “Why don’t you take a cooking class?” Um, hello people! Allergic to everything, right here! You think it’s safe for me to go to a cooking class with 10 other people who are using peanuts, or kneading bread dough where the flour is going airborne? I want to live, I say! Instead, the wave of the future — and why this is called Smart Cooking! — is that the combination of technology for precision cooking with cooking videos that teach you each step of the recipe’s process is a cooking practicum instead of a static cookbook experience. In fact, I started using the Cue app’s recipe library more often than one of my favorite digital recipe libraries, Allrecipes.com. needs of your first-class eater. Having owned that I am the best person to feed me (with my M being the next best because he’s the better cook, but he’s not me! ), the Hestan Cue has been one of the most radical changes to the way I think about food and home entertainment in the past five years since my diagnosis of Celiac Disease. Not only is it cool to cook on it (trust me, you will impress your friends), you can learn to cook things you never tried before, with less worry that you will screw it up. I did notice that whenever I ask if friends want to come for dinner, they no longer think I’m going to serve my “weird” food. I can send them a menu of what I’ll be serving, customize it to everyone’s needs, and create memorable eating experiences, even on my restrictive diet. The Hestan Cue with the Cue App has increased my confidence in cooking fancy foods with my restrictions in place. And since i have friends who have similar food restrictions as I do, it’s easy to communicate how I can keep an allergen free cooking environment, with easy clean up, between cooking batches of food. Try doing that with a heavy cast iron skillet. While i enjoy the cast iron skillet (and it will get heavy use during camping season), the Hestan Cue is a bit more easy to wield. Additionally, the Hestan Cue is portable enough to pack up and take to a friend’s home. Imagine you have been invited to someone’s home for a potluck that isn’t safe for you to partake in. With permission, you could set up the Hestan Cue on a separate table near a plug and a window, cook your food safely, and tuck it away before eating with everyone else. Yes, you can always pack up your Tupperware of foods and reheat in a microwave. But there are times when you want a hot meal that was freshly cooked. And for a variety of reasons, your friends and family seeing you not feel sorry for yourself while you are cooking your food may actually make them feel better about how you have managed to make food fun again. It’s a win for everyone. Hestan Cue’s culinary team is committed to adding more recipes that accommodate special needs, such as vegan, dairy free, gluten free, pescatarian, nut free, egg free, and Paleo. 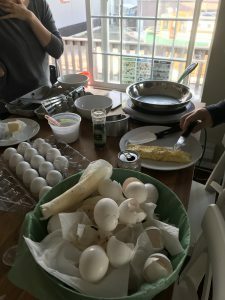 One of their team members set up a phone call for us to talk about these dietary restrictions and what some of the challenges I have in trying to work with the recipes that need additional substitutions. Talk about customer care! Have you received that kind of courtesy from any other brand of cookware? You may have noticed that I have not mentioned anything about the price of the Hestan Cue system or any of its additional accessories, such as the Cue Pot, or the Joule sous vide circulator, other than what I mentioned in the disclaimer at the beginning of the post. I am well aware that the price for the Hestan Cue is outside the budgets of those of us who are struggling with serious medical conditions that have rendered some of us unable to work, and beholden to medical expenses that require the bulk of our incomes. For those who do have more disposable income, or have generous friends and family members who would want to purchase you something you can use to help feed yourself, the Hestan Cue has been well worth the price. I have lost count of the delicious and nutritious dishes, desserts, and sides I have created on the Hestan Cue, not even counting all the bacon I have cooked on it to fuel my Ironman training bike rides. Unburned bacon on a long ride is more awesome than you can imagine, as is perfect sous vide fish on top of the world’s second largest salad, post ride. With a low learning curve if you have the patience to buy the ingredients and adjust them to your needs, the Hestan Cue has helped me put the final nail in the coffin regarding the desire to eat out to get fancy food. Now, fancy food is at my fingertips whenever I want it. And it has truly helped me make food fun again, anytime, and nearly anywhere there’s an Internet connection. My thanks to Lorraine, Julian, the engineering team at the Seattle Hestan Cue office, and the caring people at the California office for their kindness, passion, and interest in my experience with their extraordinary product. And a special nod to Phillip Tessier, who’s cooking videos inspire users to create these beautiful dishes long after he has been filmed.